The Chevrolet Spark is one of three small cars that General Motors could import to the United States from China. SHANGHAI -- The Chevrolet Spark is one of three small cars that General Motors could export from China to the United States starting in 2011, sources in China say. GM expects to sell about 17,300 China-made vehicles in the United States in 2011 and to triple that to about 51,500 in 2014, according to a planning document that GM circulated among U.S. lawmakers. The document did not name models or say what their brands would be. The plans are subject to change pending the outcome of negotiations with the UAW and already have drawn fire from lawmakers and others. If GM goes forward with the plan, it likely would become the first major automaker to ship Chinese cars to the United States. Ford Motor Co. has no plan to export its China-made cars to other markets, Robert Li told Automotive News China on the sidelines of the Shanghai motor show in April. Li is executive deputy general manager of Changan Ford Mazda Automobile Co. in Nanjing. Chrysler LLC has scrapped plans for a small car from China. Honda Motor Co. exports cars built in Guangzhou to Europe but has no plans to ship them to the United States. John Zeng, Global Insight's senior market analyst in Shanghai, thinks the cars for export will be Chevrolet-badged small cars, including the Lova, Aveo and Spark. "These are the cars GM will likely export to the United States, as it doesn't have small-car capacity there," Zeng said. The 1.2-liter Spark is made by SAIC-GM-Wuling Automobile Co., owned by Shanghai Automotive Industry Corp., GM and Liuzhou Wuling Automobile Co. in the southwest China region of Guangxi. SAIC-GM-Wuling, mainly a minivan maker, has an annual capacity of 900,000 units. 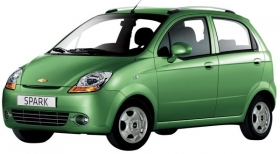 The Lova and Aveo are built by Shanghai GM's Dongyue plant in east China's Shandong province. The plant's annual capacity is 240,000. Shanghai GM is a joint venture between GM and SAIC. Each model is available as a four-door sedan and five-door hatchback with 1.2- to 1.6-liter engines. They sell for 72,000 to 108,000 yuan, or $10,560 to $15,840 at current exchange rates. In 2008, Shanghai GM exported small cars and microvans to Southeast Asia, central Europe and other developing markets, such as Chile. It also exported the Cadillac SLS sedans made in Shanghai to the Middle East. The SLS is a stretch version of the STS sedan. In 2007, Shanghai GM exported about 20,000 vehicles. Its 2008 export volume was not available.